The grand wizard and vocal technician in history of classic rock and heavy metal sadly passed away just 2 years ago after suffering from cancer, leaving behind all those great songs for all of us to hail! 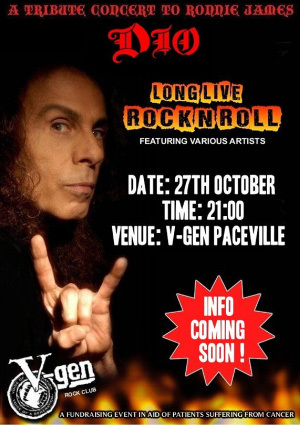 To commemorate the music repertoire by Ronnie James DIO and his related bands, we’re getting together for this TRIBUTE CONCERT to DIO – LONG LIVE ROCK AND ROLL, raising funds for patients suffering from cancer. Leo (Forsaken); Jordan (Nomad Son/Frenzy Mono); Mikaela; Chris (26OW); Jozi, Paul (Colourblind); Daryl, Angela, Laurence (12thOde); Yorika;Steve Lombardo(BNI); Paul Fiku (Purple Haze);Albert Bell (Nomad Son/Forsaken).